← Woodn’t You Rather Have A Woody? Cougars are much rarer than Mustangs. They were more expensive, being Mercurys, and they were a little bit bigger than the ‘Stangs and heavier, so they were less popular with the 0-60 set and far fewer cats were sold than pony cars. Still, by 1969 you had to have performance to compete in the sporty car market so Mercury introduced the Eliminator package for the Cougar, with suspension upgrades and a choice of V8 engines. This particular Eliminator was spotted at the Hot Rod Power Tour. It’s hard to tell what’s under the long hood. The 290HP 351 “Windsor” V8 with a 4 bbl carb was standard on the hi-po cats, but the Eliminator could be ordered with a 320 horse 390, two different 428 Cobra Jets, one with functional Ram Air induction. The famed Boss 302 V8 was also available (with a standard rev limiter to keep warranty costs in check on what was essentially a race engine for the Trans Am series), though fewer than 200 ’69 Cougars were ordered with that powerplant. According to Ford documents, two Eliminators, used as drag racers, were built with the monster 429. The 428SCJ, an upgrade to the already powerful Cobra Jet, was also available. So the Eliminator was a serious muscle car even if it was a bit heavier than its Mustang cousins. This yellow Eliminator looks to be in 100 point show condition, probably better than when it left a Ford assembly line in the late 1960s. 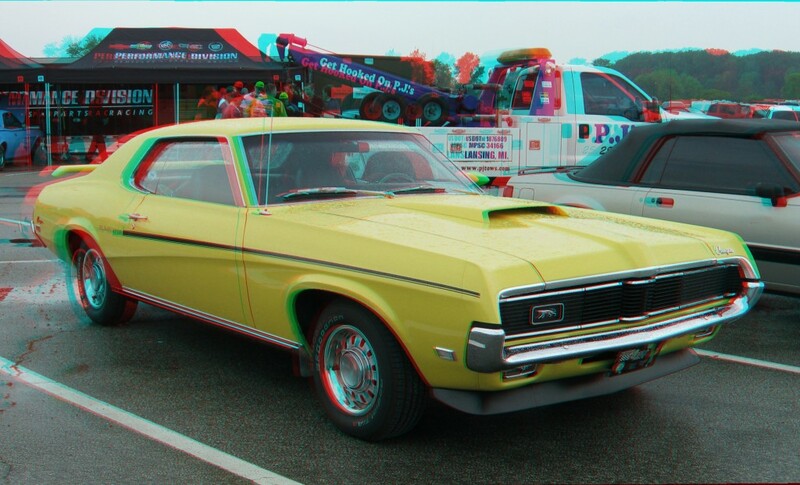 This entry was posted in 3D Imagery, 3D Photos, Mercury and tagged Cougar, Cougar Eliminator, Mercury Cougar. Bookmark the permalink.